I have been following the career of my friend and talented contemporary artist Stephanie Hirsch for many years now. Her latest body of work, where pop art meets spirituality, is currently showing at the Lyons Wier Gallery in New York City until December 14th. 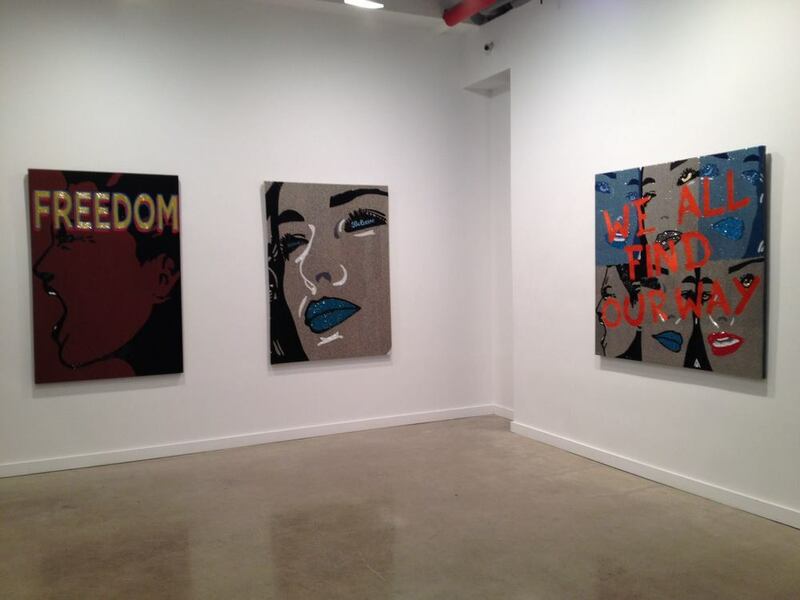 Her art is also available at the esteemed Art Basel Miami show (December 5th through 8th, 2013). I am excited to share my obsession with Stephanie Hirsch's art with you--she is certainly one to watch! Throughout her use of beads, sequins and embroidery, Stephanie's canvases are "illuminated" with phrases of enlightenments and hope. The use of the figurative element humanizes her compositions and is based upon self-portraits driven by her fascination on the whole social media "selfie" craze. 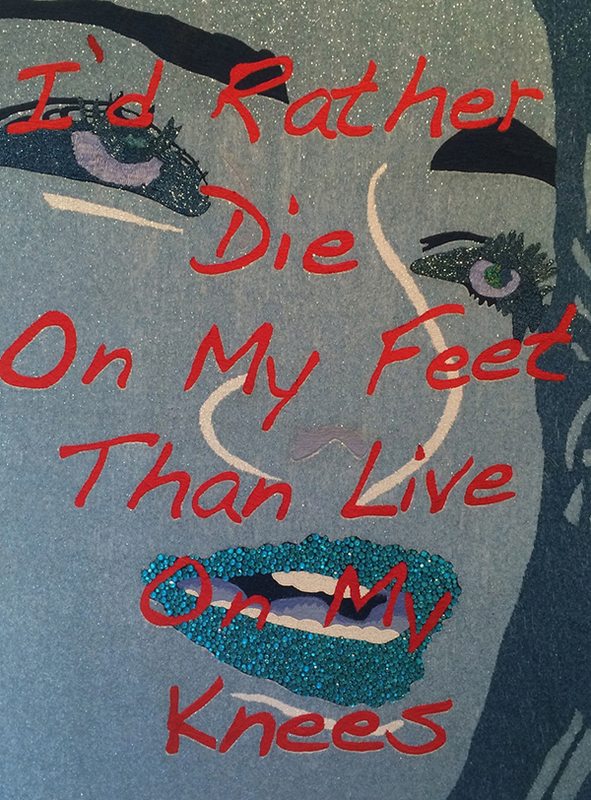 Inside the Lyons Wier Gallery: The Stephanie Hirsch exhibition, "I'd Rather Die on My Feet Than Live on My Knees." Hirsch states, “I was also inspired by Cindy Sherman’s work titled ‘Aging Socialite.’ Sherman perfectly executed the daunting look in the eyes that spoke of insecurity and fear of a life no longer lived. My fear of just existing while living promoted my ‘selfie’ study as well." Stephanie's work displayed at the Art Miami show! Stephanie Hirsch has shown in exhibitions in New York, the Hamptons, Miami and San Francisco. She was a featured artist in Miami Design Districts Art Walk (2012) and showcased in the Mercedes Benz VIP lounge at Lincoln Center during New Fashion Week (2012). Hirsch was among 30 artists commissioned to create a unique commemorative crown for display in Harrods (London) in celebration of the Queen's Diamond Jubilee. She is also the founder of Inca resort wear and author of "Mother Nurture" published by William Morrow (2008).